The strength and direction of the wind affect any water workout. For the first 1000 meters after leaving BIAC, the waters are fairly protected and can be deceiving. 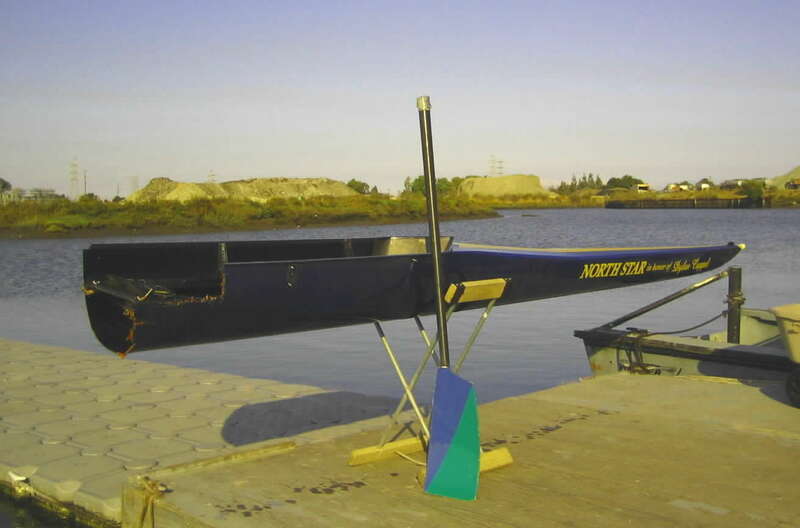 Check the wind online before you row, or observe the nearby flagpoles as you arrive at BIAC. Winds higher than 15 MPH (about 13 knots) are dangerous for small boats. The winds tend to be calm until around 10:00am, when they begin to build. By afternoon they often blow from the NNW at 12-15 knots or better. But when bad weather is coming, the wind roars from the South. If you are on the water when wind conditions change, be aware of white caps (cresting waves). Our channel offers natural land protection; use it! 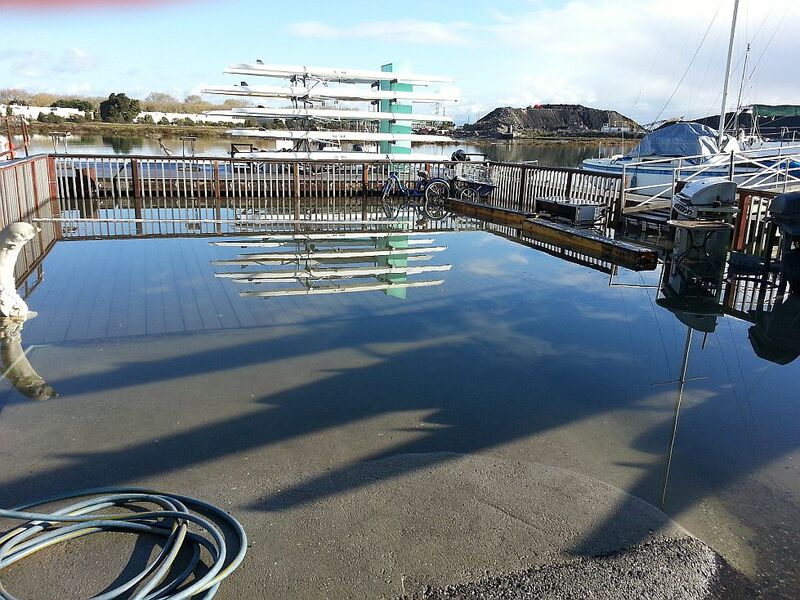 Our location can be challenging at extremely high tides (+10 feet), when even our upper deck may be underwater (see left photo below); and at very low tides (-2 feet), when all but one dock is sitting on the mud (see right photo below). Pay attention and plan accordingly. Many areas around Bair Island are mud flats during low tide. These shallows are outside the channel and limited to the sloughs and littoral bay waters. 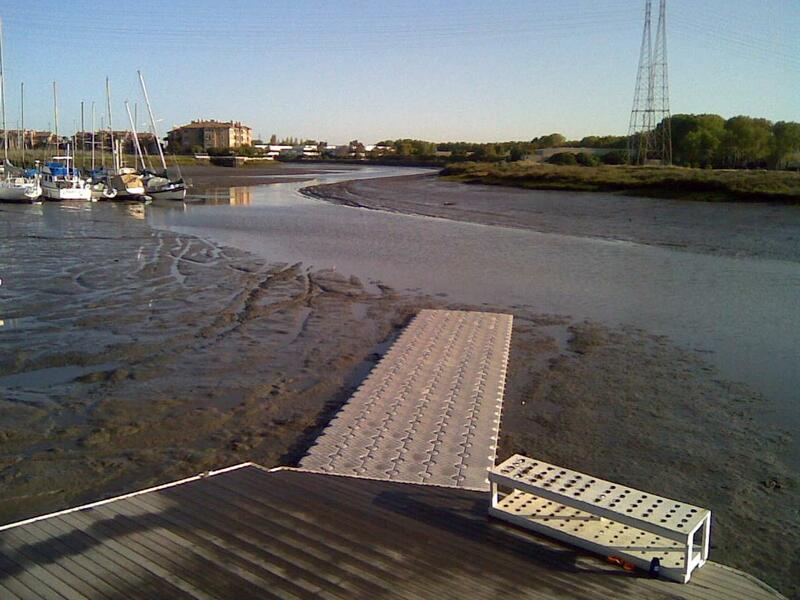 For instance, the Corkscrew Slough is only passable at a tide level of 5+ feet. BIAC also observes the cold weather "100 Degree Rule". Simply put, if the sum of the air temperature plus the water temperature is less than 100 degrees (Fahrenheit), you face the grave danger of cold shock and imminent drowning if you should capsize or fall into the water. On such days it is safer to work out on an erg. Sometimes in spite of our best efforts, we run into something. If there is injury or damage, you must report it. Each incident offers a chance for us all to learn and to help with our insurance claims. Please report all incidents involving injury or damage by submitting a Maintenance Ticket online. The order of responsibility for completing the form is coxswain, coach, stroke, crew. Though it is to see this severed bow from a two-year-old carbon fiber Vespoli eight, no one was injured in the incident. In poor morning light the coxswain ran the bow rigger into a harbor piling. Two coaches' launches brought everyone to safety.